I was having a conversation with an acquaintance about courses that were particularly useful in our work. My forestry degree involved completing 50 compulsory + 10 elective† courses; if I had to choose courses that were influential and/or really useful they would be Operations Research, Economic Evaluation of Projects, Ecology, 3 Calculus and 2 Algebras. Subsequently my PhD was almost entirely research based but I sort of did Matrix Algebra: Dorian lent me his copy of Searle’s Matrix Algebra Useful for Statistics and passed me a pile of assignments that Shayle Searle used to give in his course in Cornell. I completed the assignments on my own pace and then sat a crazy take-home exam for 24 hours. Later that year I bought a cloth-bound 1982 version of the book, not the alien vomit purple paperback reprint currently on sale, which I consult from time to time. Why would one care about matrix algebra? Besides being a perfectly respectable intellectual endeavor on itself, maybe you can see that the degrees of freedom are the rank of a quadratic form; you can learn from this book what a quadratic form and a matrix rank are. Or you want to see more clearly the relationship between regression and ANOVA, because in matrix form a linear model is a linear model is a linear model. The commands outer, inner and kronecker product make a lot more sense once you know what an outer product and an inner product of vectors are. Thus, if you really want to understand a matrix language for data analysis and statistics (like R), it seems reasonable to try to understand the building blocks for such a language. The book does not deal with any applications to statistics until chapter 13. Before that it is all about laying foundations to understand the applications, but do not expect nice graphs and cute photos. This is a very good text where one as to use the brain to imagine what’s going on in the equations and demonstrations. The exercises rely a lot on ‘prove this’ and ‘prove that’, which lead to much frustration and, after persevering, to many ‘aha! moments’. 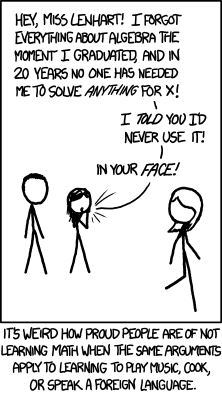 XKCD 1050: In your face! Actually I feel the opposite concerning math. I am the first to accept that I have a biased opinion about this book, because it has sentimental value. It represents difficult times, dealing with a new language, culture and, on top of that, animal breeding. At the same time, it opened doors to a whole world of ideas. This is much more than I can say of most books. PS 2012-12-17: I have commented on a few more books in these posts. † A good part of my electives were in humanities (history & literature), which was unusual for forestry. I just couldn’t conceive going through a university without doing humanities. “Hands-On Matrix Algebra Using R: Active and Motivated Learning with Applications.” (2011) World Scientific Publishers: Hackensack, NJ. Thanks for the suggestion; I’m sure that some of the readers of this blog will check it out.